First, the definition of bilingual – communicating in two languages fluently, or to further define language, communicating in two different methods of exchanging information fluently. 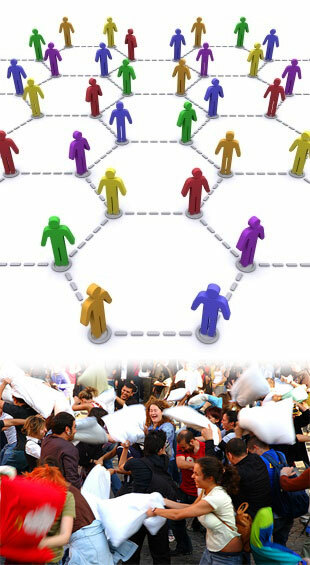 Second, the definition of social network – is the organic gathering of individuals into specific groups; or from wikipedia, “a social structure made of nodes (generally individuals or organizations) that are tied by one or more specific types of interdependency, such as values, visions, ideas…” This can be physical, or virtual. In the best-selling book, Bowling Alone, author Robert Putnam laments the loss of social groups like bowling leagues and membership clubs. However, if you ask the millennials/gen yers and progressive gen xers, they feel those measures of community aren’t spontaneous and fluid enough in a world where a hundred people who never met can gather in a square at the exact same time, and have a pillow fight. Many stick around in the aftermath and make new friends, strengthen old ones. Think of it as the light-hearted opposite of a community coming together to build a dam of sandbags during a natural disaster. However, how is it that these people were able to pillow bond seemingly out of the blue? Just like those who are bilingual with spoken languages, those who are bilingual in social networks can flow in between the virtual and physical world seamlessly, fluently, without even thinking about it. One example of a bilingual social network is CreativesDC, a virtual social network of 300 creatives (and growing) in Washington DC that meet up face-face once a month to network, experience interactive performances, and introduced to other social networks and crowdsourcing opportunities. Update: Six days later, a Facebook pillow fight.